How to Overcome or Deal with Lack of Focus? You get up in morning feeling tired and you just can’t get to make yourself feel excited about the day. Sitting at your desk your mind seems to wander and not able to focus on the tasks that are right before you. Things all seems to be cluttered in your head and nothing works out well as you wanted to due to lack of focus. What is this distraction all about? It only shows that you are not able to stay focused on important tasks that needs to be done. You would seem to feel that ‘you have too many tasks to do in a very little time’. With time it will cause you to become anxious and lose interest in your work. So how can you make yourself to get focussed on your work and improve the quality of your life? Review some of the points given and practise these ideas to give more meaning to your life. Once you acknowledge that you are not able to get tasks done within specified time, then try to think about the reasons for those aspects that is hindering your flow of thoughts. Once you realise that you are lacking the factor to keep your mind focussed, then it means you have made yourself aware about it. This will help you to take the necessary steps for making improvements. Be it at work, project, ideas, activities that we are involved within our daily life, it’s better to list out the priorities. By making a list we would know what is to be done first and which one can be done later. It’s one way of bringing focus into your life objectives. If you make such a list try to arrange it in chronological order or sequence. One another way is to highlight them and display on your board so that you can review them every day. It is one way of motivating you as you would score out once the task is done. It’s a lot more encouraging as well. By having written down the goals, it is wise to break down big goals to smaller ones. As bigger goals take time to get them done, it will be demotivating to see that on our board every day. So converting those long term goals into short term goals is meaningful. It’s easier to break the tasks down to simpler tasks that can be easily understood. It would also divert our thoughts from being impossible to a possible state. Having short term goals helps one to focus and accomplish it easily. Having converted your goals to short term plans it is better to break them to smaller tasks. Once it is clarified what should be done then arrange them in chronological sequence. This will help to prioritize. By doing so, would you know which is important and to be done first. This helps to focus on the tasks or assignments. As you would be having a schedule of tasks for the day, you can switch from high priority ones to low priority ones. There could be some tasks that needs to be done or results to be passed on immediately and some tasks that can be done at the end of the working time. So it is wise to switch between tasks for the day so that your focus will be appropriate. You need to motivate yourself by often reviewing your own skills that is inside you. How do you do it? Just write down your accomplishments and achievements of past activities on paper. Paste it somewhere where you can see them every day to encourage and inspire you to work towards your goals. The challenges you have gone through and the lessons you have learned are valuable to bring your hope back on track. By looking at those regularly you could motivate yourself as well. Associating yourself with people who encourage and motivate on regular basis is one way of motivation. Such people inspire us to look at our shortcomings and try to bring our mind to focus. Though it is not the main source of motivation, it is considered as additional support. Keeping our-self associated with positive people we do not allow our mind to stagger away from our goals. Having to meet with these people regularly, we get refreshed. Achieving your goals through progress is to be sought after. To achieve the goals requires short steps to be taken by you which should contain persistence and courage to make the change. Give a tap to yourself for being able to get ahead. This small encouragement or motivation helps you to focus for the next short term goal. You will need to affirm yourself taking credit for making the small change in you. It helps a lot to stay away from distraction. Many people experience a state of distraction due to stress at work which is mainly due to short term deadlines. It’s the pressure of the ‘deadlines’ that makes one to feel the time frame is too short. You would just need to sit quietly in a room allowing yourself to concentrate. This is one way of learning to concentrate and also develop your will power. It helps to connect oneself. within. Start with 5 minutes a day and slowly expand your time to 30 minutes or one hour. Usually it is practised during the early hours of the morning in an open space or garden. As said, lack of focus is due to distractions from specific thoughts that keeps coming over and over again. The simple way is to write those thoughts down on paper. It may be one or many but by making your mind to write them down you are removing them from the mind giving you more clarity. Write down whatever comes to your mind that is causing distraction and this way slowly it can be cleared from your mind. This not only clears the clutter in your mind but helps to bring in focus to your work. Some people cannot avoid distraction which is the main cause for lack of focus. This could be in the form of televisions, internet, playing games, etc. To avoid those distractions, you could remove the battery from the remote, turn off the internet services, keep the gaming console away in a box. These distractions are turned to during times of anxiety and hence it gets into the habit or regular pattern in their lives. It’s wise to keep away from accessing this distraction. It is generally observed that people who work under certain set time frame can do enormous amount of work without losing focus on the objectives. Even if the mind is thinking about other things keeping a time bound work schedule will help you to focus on the work to be completed for the day and then relax. Make a practice of scheduling all your work for the day on fixed time frames whether it is for breakfast, lunch, bath, study, working or watching television, or hearing music. Following certain pattern brings in focus to the specific task. This will ultimately train your mind to avoid distractions specifically during work. As said, all work and no play makes Jack a dull boy. A mild depression inhibits concentration. By taking a short walk or going to the gym will definitely improve the level of focusing capacity. Exercise increases the blood flow to the brain which in turn helps to bring focus. By practising to get time off for exercise you would increase your chances for improving focus. Physicians or health practitioners recommend exercise to be part of life so that you have sound mind in sound body. It’s proven that not having enough sleep are one of the leading causes of an inability to concentrate. Exhaustion is one cause due to lack of sleep. When the mind is exhausted you cannot point or direct your mind in one direction. Sleep deprivation leads to exhausted mind, less focus on work and insomnia sometimes. Completing your chores early is wise so as to get good night’s sleep. Hence, it’s highly recommended to get adequate sleep. There are times when you forego your lunch or breakfast for completing a task. But little do you know that this could lead to exhausted body and mind. As you know exhaustion leads to lack of focus, you need to take in nutritious and balanced food to keep the level of vitamins and minerals at optimum. Maintaining the optimum is recommended dosage for bringing in focus. Start your day with adequate breakfast Drink adequate water and take short breaks during work schedule. 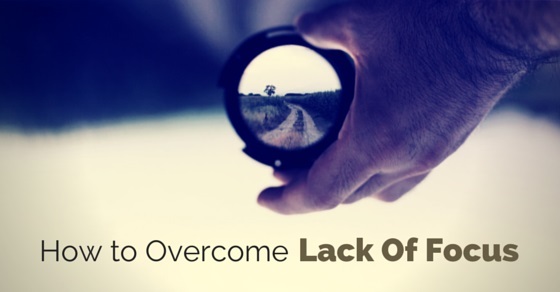 Many of us do experience the lack of focus state once in a while during our lifetime. Though there are many factors for this like anxiety, depression, menopause, attention deficit problem, fatigue, death, etc., there are several ways to improve our concentration. Review some of the above mentioned aspects and practice them for your benefit. It is sure to improve the quality of your life and of course will bring value to your life as well.